So you want to know how to get into the world of enchanting? To have the best equipment takes time and dedication to obtain, enchanting is not an exception to this. If you're a filthy casual who can't read then skip to the end for the tl;dr. While at first glance the entire process seems daunting. "How can I do this? What? This item does not have any attachment slots? What does that even mean?" Well Timmah, I'm going to tell you today! Illustrated with pictures no less! Look at this helmet, it's boring. It's bland. I want to change it into something useful. This is the first thing you need when you start enchanting; an item. Not any item can be enchanted though! All equipment besides items with charges, stone skin amulets being an example, can be. 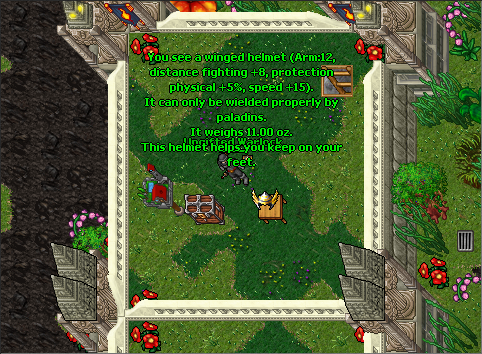 Here I have a winged helmet for paladins. It's ordinary and has no personal finesse that could help me in its fullest capacity. The first thing I'm going to need is an orb of enchantment. But one careful thing should be noted - each item can ONLY HOLD 4 SLOTS. It can hold less, but not more than that. Aw man, this thing is a beaut'! You can obtain it through bosses and Cyntara Coins. After using it, I have attached a slot onto the helmet, now it says in the description - "Enchantments: 1 slots." I should emphasis again, EACH PIECE OF EQUIPMENT CAN ONLY HOLD FOUR SLOTS. But now we're ready to apply some enchantments! There are several different types of crystals that can be attached and three different tiers. Let's look at how each one looks and what it does! The three tiers are lesser, regular, and grand. To start, THERE IS AN ENCHANTING SKILL, to see this type !skills, and each tier has different requirements to applying to them. Lesser crystals have no requirements to be put onto equipment other than having it socketed. A regular crystal requires 15 enchanting and the grand crystal requires 25 enchanting. Now, each of these can do something a little different from the others. These CRYSTALS CAN BREAK when being put onto the equipment. The first column is elemental absorption - PKers can be pesky, but what if I told you that you can have resistances against their attacks? Up to a point mind you, but you can have their damage mitigated. The second is skill - are your distance or magic levels laughably bad? This is your sure way to increase them! The third is regeneration - who doesn't love a little health or mana regen giving the boost in battle? The final column is miscellaneous - do you have piss poor loot luck? Well no more! Want to do extra damage in battle? Done. Walk faster? Off goes Timmah. Well this isn't something I wanted, so let's go visit the Tool Vendor NPC to grab some enchantment removers! The tool vendor sells them for quite the price. After buying a few of those I went back over to my enchantment spot to remove that phenomenal enchant into something I actually want. In this window you can also see how much speed it would give you. 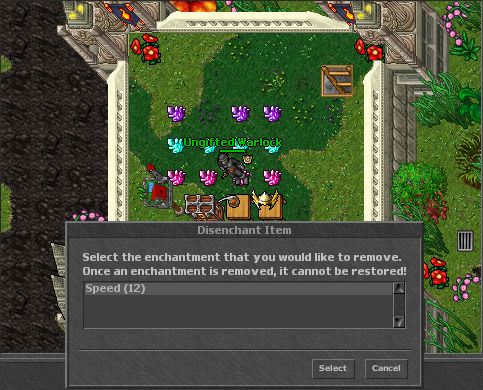 After removing enchantments your socket is not removed, but frees up the socket you had before. You are now free to apply another crystal for another chance at whatever you were trying to accomplish in life. And now Timmah, you're probably asking, "oh man, what set can I trick out to help me," now we're getting into the nitty gritty stuff. Technical stuff. On this set I would want to maybe go critical chance + skills bonus. There is one important note - there are limits on what you can stack on your character. if it goes over 100% critical hit you are wasting crystals. •et; Regeneration (mana and health) - There is no limit! Stack your character's regeneration to the sky. •et; Skills - You cannot add more than +100 skills to your character through enchanting and inherent bonuses combined. •et; Speed - 1500. This is the game server's limit, you reach this rather fast when leveling. You are able to see your walking speed in your skills menu. Additional speed boosts may be niche helpful in places like Yalahar or fighting against monsters that have heavy paralyze. Knights - these tanks have an inherited defense of 25% naturally. Paladins - these quick dudes have an inherited defense of 20% naturally. Mages - 0% inherited defense - good luck blocking. Inherited defense means they have a natural resistance to all elements and knights, obviously, have the highest amount with 25% and mages the lowest with 0%. So you have inherited defense, but you also have charms which adds onto that elemental defense (depending on what you choose, you could be one of those people who use a yellow gem instead of a nightmare doll) which you need to pay attention to Timmah. Because if you go over 50% elemental resistance you are WASTING CRYSTALS. Elemental resistance calculation isn't for the faint of heart, if you can't figure out simple math then I recommend you to go full luck because you'll need it in your life if you can't put in some hard work. To recap that all, knights have 25% reduction + another 25% on equipment or charms before they hit the limit, paladins have 20% + 30% before they hit the limit, and mages have 50% on equipment to hit the limit. And that, Timmah, is everything there is to know about enchanting. Now get out there! Go build your full luck set because you can't do math. Furthermore, enchantment crystals can be combined using the enchantment crystal combining station. You can combined 3 lesser enchantment crystals into one normal enchantment crystal and 3 normal enchantment crystals into one grand enchantment crystal. Combining has no chance of failure and as such will always succeed to combine the enchantment crystals into the higher tier. Please keep in mind that only three enchantment crystals of the same type (absorb, skills, regeneration, and misc) can be combined. The resulting enchantment crystal will always be of the same type as the three base enchantment crystals. You can find the enchantment combining station to the east below the depot. The following table shows the value ranges of enchantment crystals. To start enchanting items, you will need an orb of enchantment, you can get this from the store on the client or from bosses / quests. You only need to ‘use' this item on the piece of equipment you want to enchant. The next item you need is a lesser enchantment crystal which has no enchantment skill required to use. There are four different types of enchantment crystals; absorption, skills, misc, and regen. The amount each gives depends on the tier of crystal used. Regular enchantment crystals require 15 enchantment skill, and grand requires 25. 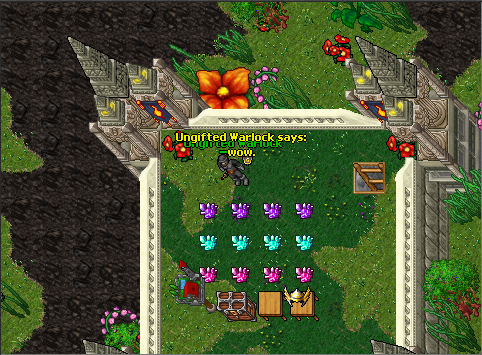 You are able to see your current enchantment level by saying !skills. If you get an enchantment you don't want then you need to head over to the tool vendor and buy an enchantment remover, this costs 50k each. •et; Regeneration (health and mana) - There is no limit! Stack your character's regeneration to the sky. •et; Skills - You cannot add more than +50 skills to your character through Enchantment. •et; Speed - 1500. This is the game server's limit, you reach this rather fast when leveling. You are able to see your walking speed in the skills menu. Additional speed boosts may be niche helpful in places like Yalahar or fighting against monsters that have heavy paralyze. Knights have an inherited defense of 25% naturally. Paladins have an inherited defense of 20% naturally. Mages have an inherited defense of 0% naturally. Each vocation CANNOT go 50% elemental resistance. You need to do some math if your equipment already has this on it. Charms count along with this resistance so take those into consideration too. If you have any questions or comments on this Game Guide, please leave us feedback on its Feedback Thread! Players that have reached Enchanting Level 20 will now have a chance to loot Enchanting Mount Recipe from bosses. Once learned, you will be able to craft an item that grants enchanting exclusive mount. 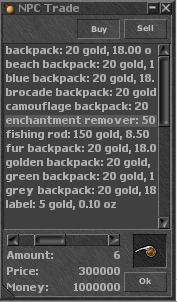 This item can be traded and sold to other players.